In 2003, the remains of a small hominid, Homo floresiensis, was discovered in Indonesia in the Liang Bua cave on the island of Flores. The remains are only about a meter in height and were likened to be hobbit-like, in reference to author J.R.R. Tolkien's diminutive race of characters in the Lord of the Rings series. The remains do not really have similarities to dwarf or midget physical structures. Archaeological evidence indicates that the Indonesian hobbit lived between 95,000 and 13,000 years ago. Arguments abounded concerning the find which includes tools said to have been used by the little hominid. 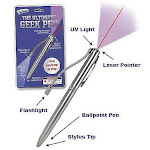 Some said its brain was too small to have allowed tool-creation and use. 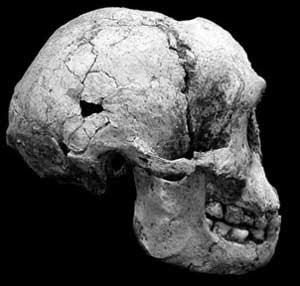 Others said the hominid was simply a different type of modern humans, as other inhabitants of the island are also small. But recent studies of the wrist bones of the hominid reveal that it's related to modern humans, but not modern. 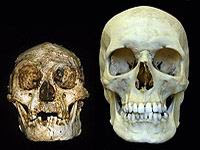 The picture on the left compares a Homo floresiensis skull with a modern/typical sized one. Jump to i-Mash for a video of the latest examination of the bones. "How to Enhance Children's Imagination of the Past When Teaching History"